Three years running, I am going for my summer open-air sessions to the town of Pushkin, former Tsarskoye Selo. This name of the town is the one I’m more familiar with because it is initially given to this city and historically more consistent. In addition to this, the town of Tsarskoye Selo is called Muses’ town. It’s true, the muses favoured creative people: poets, artists, writers, architects, and musicians. Near the Lyceum, where Alexander Sergeevich Pushkin studied, the stone with the inscription «To the Genius of the Place» has been installed. Indeed, if the genius of this place does exist, it embodies the spirit of creativity. There are many places in the town of Tsarskoye Selo, which are closely related to the presence of the famous people — scientists, writers, poets. One of them is the House Museum of Pavel Petrovich Chistiakov located on the Moscow Road (former Fridental Colony). The settlement of this area began in the years of 1816-1827. Due to the census of 1897, there were 228 people living there, most of whom were artisans who produced haberdashery: ribbons, laces, tapes. The Moscow Roadway is an old road which led from Tsarskoye Selo to Moscow as opposed to a straight road which came through Slavianka to Izhora. A trip on this road was allowed only to those people who had the right to do that or had an urgent need. Behind the Moscow Gates, there was an outpost. On one side of the road (on the left if you are back to the Gospitalnaya street), there were the houses of colonists while on the right there were the country houses of wealthy people. In one of these houses, lived Pavel Petrovich Chistiakov, who, according to Vladimir Stasov, was the teacher of all Russian artists. 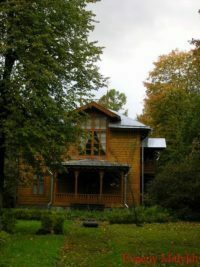 He lived there from 1876 to 1919, until his death This country house (dacha), later the artist’s residential home, was situated in the amazingly picturesque settings. Between the Pavlovsk roadway and the Moscow roadway, there was the Separate (Otdelny) Park designed in the style of English landscape design. Here there is the extensive Colonist Pond and the dacha of Grand Prince Boris Alexandrovich, built as an English cottage. For Pavel ChistiakovTsarskoye Selo and its surroundings had been quite familiar. Before the construction of his big country house, Pavel Petrovich had had a small home in one of the villages near the town of Pavlovsk. The dacha next belonged to V.V.Deriker, who was a prominent homoeopath in St.Petersburg and the stepfather of the painter’s future wife V.E.Meier-Chistiakova. Later on, N.I.Vavilov, a distinguished scientist and geneticist lived in this country house. The dacha of P.P.Chistiakov was designed by A.H.Kolb, the architect who was a former student of A.P.Briullov. Nevertheless, the artist himself and his wife Vera Egorovna were very much involved in the creation of the exteriors of this house and its interiors. Wood carving on the facade, a weather-vane and the ceiling painting in the dining room — all these elements of decorum were included in the composition of the house by the architect who was influenced by the artist’s ideas. The idea of the additional entrance to his studio from the street also had come from Pavel Petrovich; similarly, the wishes of the artist were implemented by the architect when the studio was being designed. Pavel Petrovich and his family lived in this house for decades. The walls of this house witnessed many events; many people have been here. This house made a good impression on people. It looked like the house whose residents lived in plenty. A large circle of friends and family gathered there. But above all, anyone who needed help and support could get them in this house. The doors of this house were opened to all in need. Many artists, scientists, and writers were here such as V.E.Savinsky, N.A. Bruni, A.A.Rizzoni, A.L.Ober, N.A.Laveretsky, A.P.Karpinsky, I.V.Ershov. The family members of the families of D.I.Mendeleev, O.D.Forsh, and I.I.Sreznevsky used to visit the house of Pavel Chistiakov. Next to Pavel Chistiakov’s house there where the houses where lived the artists M.N.Vasiliev, K.A.Gorbunov and sculptor M.V.Kharlamov. Next door to the dining room is the living room. The decoration of its interior gives a complete picture of the lifestyle of intelligent people in the 19th century. There are the photos and pictures of Pavel Petrovich and Vera Matveevna Baruzdina, his disciple and niece. Pavel Petrovich was of the high opinion of his niece’s talent. He said that the only two people who mastered his artistic and pedagogical system were Valentin Aleksandrovich Serov and Vera Matveevna Baruzdina. One can imagine how the evening parties passed in this living room: somebody was playing big piano, the music was playing and the guests were having the nice conversations looking at the photos in the family album. The next room is a small living room. This room gives us the information about the friends of Chistiakov. There are the portraits of the writer Olga Forsh, J.V.Durdin, the artist’s nephew and many other people who were close to Chistiakov’s family on the walls. Nowadays temporary exhibitions of contemporary artists are being arranged in the small living room. It goes without saying, the artist’s studio itself is the «holy of holies» at this home. Well light and thought-out, this studio was designed according to the wishes and needs of the artist. The light penetrates into the room from the huge window looking to the Moscow road and from a smaller window on the next wall. This room looks like it is filled with air, and it’s easy to breathe when working in it, and you want to create something beautiful. Many paintings that are created in the different years can be seen here on the walls of this room. The portraits of an Italian girl, a custom-made picture of a woman and a male portrait are among them. Two of his pictures draw our attention: it is «The Blessing of Children» and the portrait of the mother, which is painting with great love, attention to a detail and great mastery. Before the renovation of the museum, which began in 2006 and finished only in summer 2009, visitors could just see the canvas «The Last Minute of Messalina, the Wife of Emperor Claudius.» This painting was supposed to be some sort of a report on his training experience in Italy. The artist had been painting it for many years, but, unfortunately, he did not finish it for many reasons, and still, it remains as the study guide on how to create a picture of a large size. All stages of this composition can be seen. When the museum building was renovated, the picture was taken to the State Russian Museum for the restoration, and due to the fact that the size of this canvas didn’t allow it to be transported in a usual way, in other words, to be taken from the studio on the canvas stretcher, the picture had to be taken from its canvas stretcher and wind on the roller. When it had been restored, therefore, to bring it back, it was necessary to take it again from the canvas stretcher that would make no sense and the colourful layer would be damaged. So, the master’s work remained in the Russian Museum. The artist’s studio is a place where he stays alone with himself and his images which then enter the world and become close to a spectator. However, Chistiakov gave his heart and soul to people not only by delivering his ideas through his pictures. Today he would have been characterized as a teacher God gifted teacher. At the time he had come to St.Petersburg, he entered the Academy of Arts. He was pretty young. Not only did he set a goal just to gain professional knowledge and acquire skills which were so necessary for him as a professional artist, but do deal with many other mundane goals. He had to solve such issues as how to get by in the capital, to make a living, and more importantly, save the money which he had earned. Pavel Petrovich lived far from the Academy, near the Alexander Nevsky Monastery. There were days when he had to walk about 30 miles, saving the money for a cabman. In addition to this, he had to visit his students at their home and give them lessons on drawing. Paradoxically, teaching began to play a totally different role in his life. It had become the area of his expertise. In addition to his private lessons, he had classes at the School of the Arts Promotion Society. The pedagogical activities of Pavel Petrovich were not always in favourable conditions. For a long time (about 20 years) he worked at the Academy as an Associate Professor, Assistant Professor, Professor on Duty. And only in 1892, he received the rank of the Second Degree Professor. However, he didn’t have an official personal studio where he could teach students. His classes on drawing, arranged in his home studio, were free of charge for the students. He attracted the attention of many people. He was highly respected by many artists, who had graduated the Academy and then took lessons from him. One of his students was Ilya Repin. And only at the end of his academic service, after the resignation of Ilya Repin from the Academy, Chistiakov received his personal studio, the former studio of Ilya Repin. Unfortunately, he was not very young to use this benefit long time. After two years of teaching at the personal Academic studio (1908-1910) and after two more years, in 1912, Pavel Petrovich retired. «One is never a prophet in one’s own country». This well-known saying comes to my mind when thinking about Pavel Chistiakov and his professional career. Moreover, during the years of his service at the Academy Chistiakov didn’t have a personal studio, but being in the position of the head of the Mosaic Workshop of the Academy of Arts, he had to do the work to which he did not incline. It was the administrative work: he had to supervise the process of creation of the mosaics for temples and other public buildings throughout Russia. Undoubtedly, it is vital for a person who chooses art as a profession finding their way of life to meet a wise mentor. For many artists, including almost all our outstanding masters, was Pavel Petrovich Chistiakov. He was highly respected by such famous artists as I.E.Repin, V.I.Surikov, M.I.Vrubel, V.A.Serov, M.V.Nesterov. He was able to recognise the talents of young artists and properly guide them. Being able to teach is a high art. The process of studying itself became very interesting and captivating for the students who studied with Pavel Chistiakov because his method was not based on the classical traditions elaborated during the centuries. Insisting on studying real life, Pavel Petrovich didn’t force his students to fit their drawings to traditional examples. Contrary to the classical methods of drawing when the artists had to copy carefully the object they drew, follow classical antique canons and even improve the imperfections of models by trying to make them look like ideal antique examples, Chistiakov taught his students to see nature and the world around us and to perceive the image as a whole. «Draw the nose, but think about the ear.» For the students, this instruction had become one of the vital principles to be used when drawing an object. Chistiakov also taught his students how to see the colour and tonal correlations in painted objects. In the opinion of Pavel Petrovich, the artist, creating their painting, should not be focused on the excellent proportions of human bodies or the perfectly well-arranged environment, as it was vital for the traditional academic method of painting. The relationships between heroes and their emotions is that is really important. It was these principles that he used in his paintings. Starting with the composition «Sofia Vitovtovna at the wedding of the Great Prince Basil the Dark» painted for the big gold medal contest which gave him the right to go abroad for professional training experience. Pavel Petrovich Chistiakov showed his interest in all phenomena of life. He studies the history of art, followed the news of artistic life, read art critique. In addition to this, interests were not alien to literature, natural science and music: he had an inquisitive mind. Even Ilya Repin in his memories «Close distant past» admitted that Pavel Petrovich liked theorising very much. Regrettably, this so energetic and talented person did not adequately fulfil his ambitions. After his death, many of his paintings remained unfinished. In his diaries and letters, he paid lots of attention to the ideas about art and pedagogical methods. Unfortunately, the research work on the methods of art teaching had not been created. Pavel Petrovich had always dreamt of that work. Nevertheless, his method of teaching has proved as a very effective for many generations of students. This method is still being used for teaching realistic drawing. And perhaps, the fact that the house in Tsarskoye Selo where he lived for many years has survived and the memorial museum has been created in it could be regarded as a miracle. I.V.Durdin, the grandson of the artist, recalled how the town of Pushkin (Tsarskoye Selo) looked when he saw it in the first months after its liberation. The palaces, parks and many of the town’s buildings were burnt: the town itself was severely damaged. However, the house of Pavel Chistiakov began to change in the pre-war years. In the lifetime of the teacher, when the avant-garde tendencies in art began to gain strength, the artist was unrecognized by the new authorities, treating him as a bourgeois painter and taken away from him his pension and all his academic titles. He died in his home in a cold and hungry 1919. Gradually, the house where the family of artist lived, was «densified», as it was said in the first years of Soviet power. It was characteristic of that period. The existing rooms were divided into the even more significant number of rooms. Therefore, the private apartment had been redesigned: it had served its purpose as a communal apartment. The rooms were shared by a few different families. The studio of Pavel Petrovich rented the Leningrad Union of Artist of the RSFSR. Such artists as V.E.Savinsky, A.P.Pochtenny, T.P.Liakin, A.V.Mazhaev worked there. The famous pavilion «The weeping of Yaroslavna», where on the ground floor were located service room and in 1916 lived the writer Olga Forsh with her family, had been destroyed after years of neglecting. The writer returned to the Chistiakov house after the WWII. She lived in the house from1947 to1953 and worked in the artist study over the novels «The Mikhailovsky Castle» and «The Firstborn of Freedom». But things go back to square one. In 1929, on the initiative of the circle of Pavel Chistiakov and to the 10th anniversary of his death, a plaque was installed at his home. At that time, the memorial plaque was installed in the studio. On this plate it was written: «Posterity, guard the place for the creative activity of the great artist and teacher Pavel Petrovich Chistiakov.» On 1 June 1958, by the 125 anniversary of the artist’s birth, at the Kazan Cemetery of the town of Pushkin was unveiled a headstone monument. The decision to establish the memorial museum was adopted by the Leningrad Executive Committee (Lengorispolkom) in 1979, and the museum itself was opened in April 1987. The creation of a memorial museum or even an exhibition is not an easy task as it may seem. It depends on many factors. In the main, for the scientific community, two ways are possible. The first one is showing the atmosphere of the epoch and putting forward the image of the protagonist to whom the exposition is dedicated.The most illustrative example of such an approach is the House Museum (whose another name is the house of the Turbins) in Kiev, where the original writer’s belongings are adjacent to the imitations of the real objects painted white. The research fellows used this method to focus on the historical artefacts, separating them from the replicas. The exhibits are highlighted by the light which is directed to them. The technique which is used by the designers of the exhibition help visitors to concentrate on the objects and immerse in a particular historical environment. The second method is to focus on the authenticity of the environment and the exhibits, which are to be shown at the highest level of professionalism, so the spectator not only could see them, but feel the magic of the person to whom the exposition is dedicated. It was this method which the staff of the Chistiakov House-Museum chose. The fact that the relatives of Pavel Chistiakov preserved his paintings, as well as the furniture of his house and his studio, also played a decisive role. It was the significant contributions of O.E. Meyer, the niece of Chistiakov’s wife, and Y.V.Durdin, the grandson of Pavel Petrovich, who donated the artist’s belongings and precious documents to the museum. As in the old days, the house welcomes its guests. The atmosphere of hospitality and comfort are the features which are very important for the visitors. One of the museum’s halls, a small living room, was given to artists for temporary exhibitions. On the second floor, there is a lecture room where the film about Chistiakov is demonstrated. Musical events are also held in the living room. The museum is open to people. Admittedly, the House Museum of Pavel Chistiakov is not as a popular tourist destination as the world famous parks in Tsarskoye Selo: no crowds of people, no countless number of shuttles can we see here. This museum is designed for a narrower audience, specialists and the people of interest in the Russian Art of the 2d half of the 19th and the beginning of the 20th century. But each person who enters the museum is always fascinated by its cordial atmosphere: everyone is loved and welcome here. All that remains to wish the museum to have more visitors coming here. Many of us have seen «The Idiot”. The TV series, directed by Vladimir Bortko, was based on the eponymous novel written by Fyodor Dostoevsky. A large part of this film was filmed here — at the Chistiakov’s dacha (Lebedev’s dacha in the movie).These episodes were filmed in the authentic settings: it plays a very important role in the creation of the environment of the 19th century. I like coming here. The atmosphere of this place is similar to the atmosphere of Chekhov’s drama plays and stories. This house with the front porch and veranda, the garden, where many flowers are changing each other every season, entice you to stay here for some time sitting on the bench and reflecting on something. It seems that the next moment the owner of this house will join you for starting a slow conversation. It’s really enjoyable, and I’d like to express my gratitude to the museum’s staff for keeping all these treasures for us. 1. Бунатян, Г.Г. Город муз, Лениздат, 1987.301 с. 2. Вильчковский, С.Н. Царское Село. С.Петербург, Титул, 1992. 278 с. 4. Молева, Н., Белютин Э., Павел Петрович Чистяков., Москва, искусство, 1954. 85 с. 5. Репин, И.Е. Далекое близкое. Ленинград, художник РСФСР, 1986. 488 с.
Петербург, Серебряный век, 2007. 312с.